Yes, they’re called “Makem and Clancy,” but they’re not that Makem and Clancy. Not exactly, anyway. Rory Makem and Dónal Clancy – the sons of Tommy Makem and Liam Clancy respectively– are justifiably proud of their families’ storied place in Irish music, and both had the opportunity to perform with their famous fathers over the years. They’ve also forged their own musical paths. 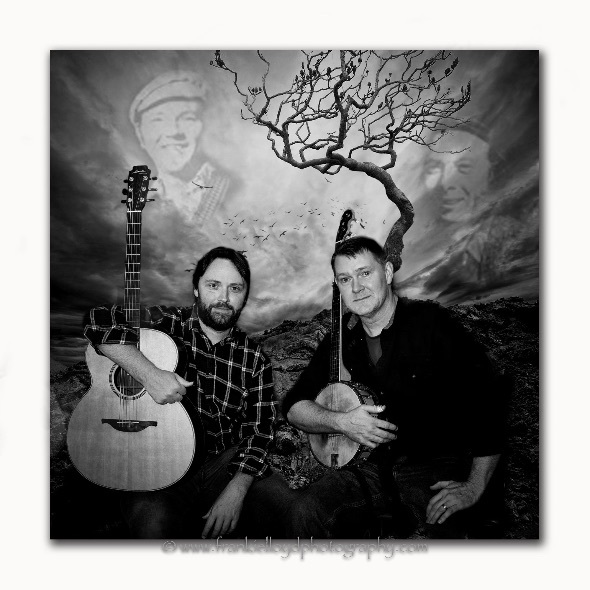 It is no surprise that Rory and Dónal are each acclaimed Irish singers and musicians as well as masterful storytellers with a witty and charming stage presence. Born in County Louth, Ireland, Rory is a singer-songwriter and adept interpreter of folk songs. One of today's leading voices espousing the heritage of Irish music, he is a skilled multi-instrumentalist with a passion for song and an extensive knowledge of poetry and history. His "musical DNA" stems not only from his father, the late Tommy Makem, but also from his grandmother, Sarah Makem, a singer and collector of traditional songs. Rory has been performing for more than 25 years. His music can be heard on movie soundtracks and his original songs on PBS programs. He has recorded with such folk luminaries as Gordon Bok, Tom Paxton, Noel Paul Stookey, and Schooner Fare. He began his career at Bard College in New York State, where he formed a band. In 1989, he and his brother, Shane, began to perform as the Makem Brothers. The duo quickly became a trio, when guitarist Brian Sullivan joined the group. A third Makem brother, Conor, became a member of the band in 1991. By 2003 Brian had left the band. Rory and his brothers joined with Liam and Mickey Spain in and effort to preserve and advance folk music from Ireland, Britain, New England and the Australian Bush. After his brothers left the group, Rory remained with the Spain brothers, performing as Makem and Spain. When the trio dissolved in 2014, he launched his solo career. Donal Clancy, who is regarded as one of Ireland's finest guitarists, grew up in a household and community steeped in music. The son of the late Liam Clancy, Donal has focused his musical attention on his family's repertoire of songs and keeping the Clancy musical tradition alive. He spent his early childhood in Canada and the United States, before his family returned to Ireland, settling in County Waterford. Donal received his first guitar at the age of 8, a gift from his father, who was a member of the renowned Irish folk group, The Clancy Brothers and Tommy Makem, He began playing professionally as a teenager. A founding member of the group Danu, he left to join his dad and his cousin, Robbie O'Connell in a trio that toured extensively for several years and recorded two albums. In 1998, Donal moved to New York, where he performed with top Irish music acts. He toured and recorded with fiddler Eileen Ivers of Riverdance, and joined the Chieftains on their Tears of Stone Tours in Japan and the US. He has been a member of the Irish-American group Solas and contributed to the soundtrack of Ric Burns' award-winning documentary, "New York." In 2006, Donal released his first solo guitar album. Three years later, he returned to Ireland with his wife and three children. His critically acclaimed "Songs of a Roving Blade" came out in 2014. A year later, he recorded his latest album, "On the Lonesome Plain."